Moscow Mayor Sergey Sobyanin has focused on improving the quality of life in Moscow since becoming mayor in Oct. 2010, from sprucing up city parks to creating pedestrian zones among the more visible developments. 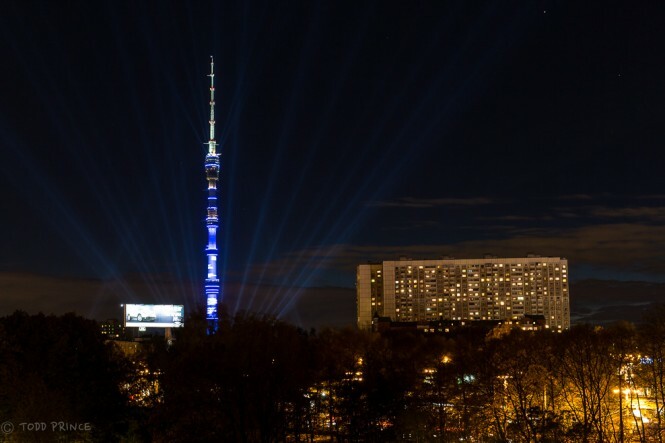 One aspect of this initiative seems to be hosting a lot more public events on the weekends, such as the ‘Circle of Light’ festival, which has become an annual Moscow event since Oct 2011. 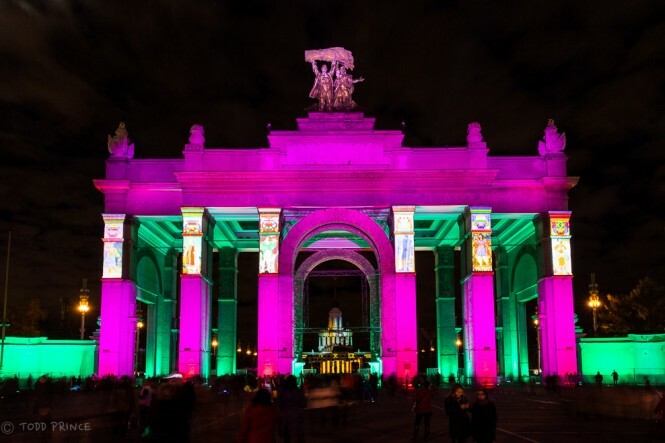 During the ‘Circle of Light’ festival, Moscow building facades become a ‘screen’ for colorful 2D or 3D multimedia shows. 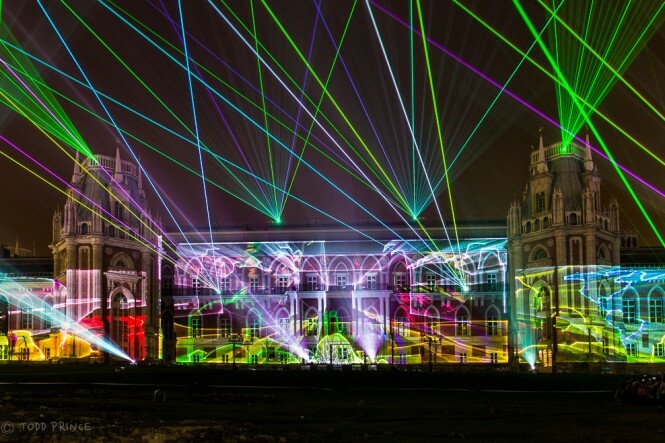 Such light shows are held in other large cities around the world including Berlin and London. New York City will host its first light festival next month. 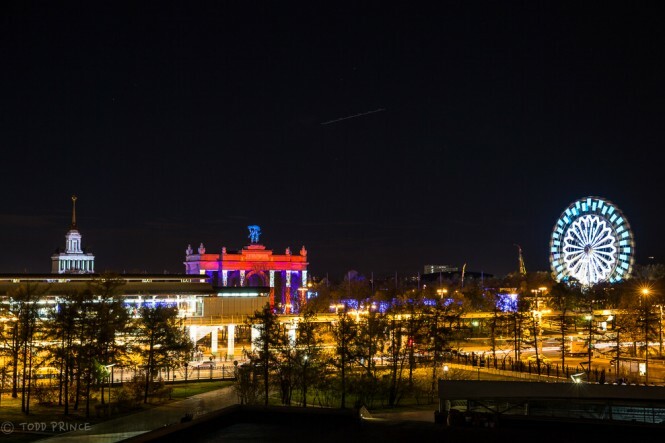 Moscow’s 4th annual ‘Circle of Light’ festival was held this month and I photographed three of the five locations, including Park Tsaritsino, the All-Russia Exhibition Center (better known by its initials VDNKh) and Ostankino TV Tower. Park Tsaritsino, one of Moscow’s most scenic parks, was packed on opening day with tens of thousands of people. The multimedia shows run for several minutes after which there is a pause, enabling people to come and go. 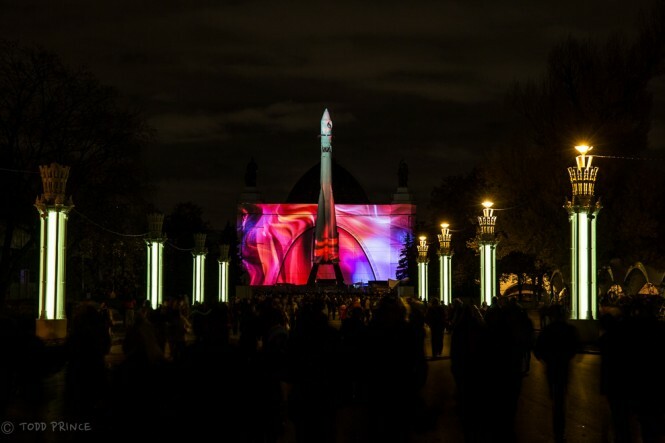 As both Park Tsaritsino and VDNKh are very spacious, there are several light installations at those locations, giving the large crowds something else to see – and photograph – once the short multimedia shows end. The Circle of Light is well worth attending, but best to go late in the evening to avoid the big crowds that amass at the start. However, if you want to get good photographs at the Bolshoi Theater, one of the other ‘Circle of Light’ locations, then best to get there 30 minutes before the start to get a good position. As the area in front to the theatre is small, it is packed the whole evening. The event runs from 7pm-11pm over the course of 4 to 5 days. The main entrance to the All-Russia Exhibition Center. A wide-angle shot of All-Russia Exhibition Center during the ‘Circle of Light’ festival. Crowds watching the multimedia show covering the main Pavillion at All-Russia Exhibition Center. A multimedia show was also displayed on the Space Pavilion at All-Russia Exhibition Center. 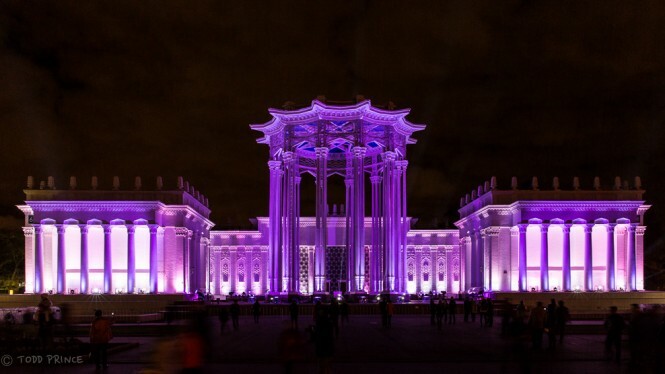 This pavilion at All-Russia Exhibition Center was lit up in constantly changing colours. 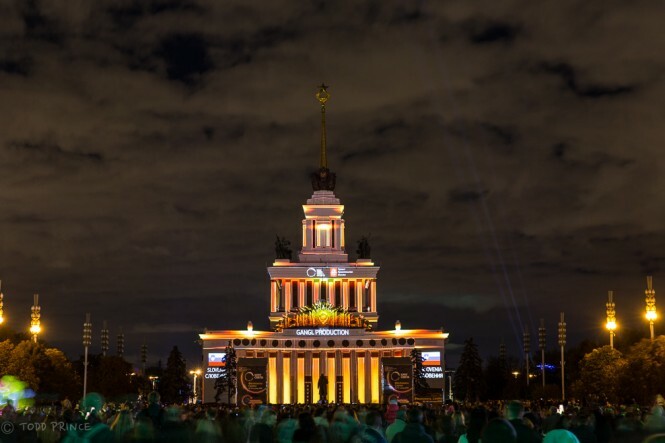 The multimedia show at Tsaritsino Park is shown on the palace facade. 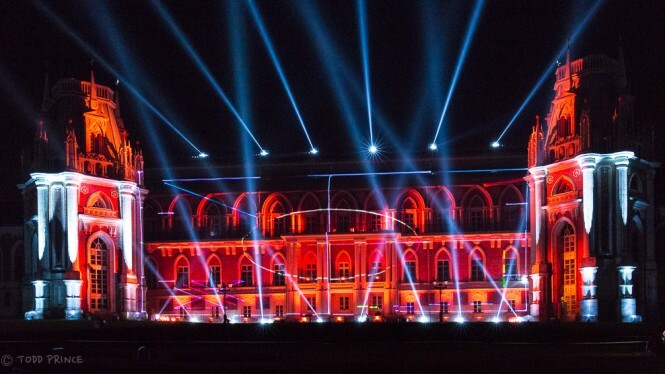 The 3D multimedia show in progress on the palace facade at Tsaritsino Park. 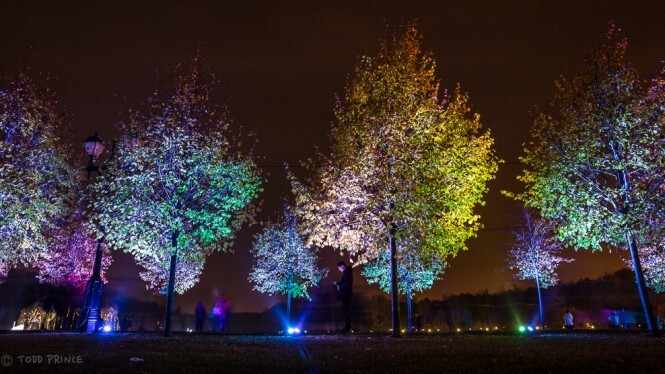 A walkway lined with trees is lit up in various colours at Tsaritsino Park. 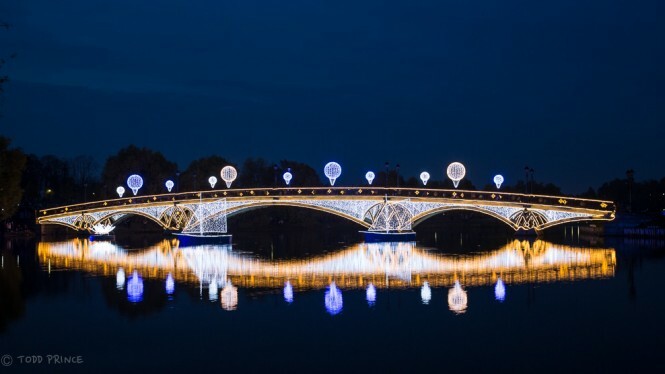 The bridge at Tsaritsino Park is covered in lights during the festival. 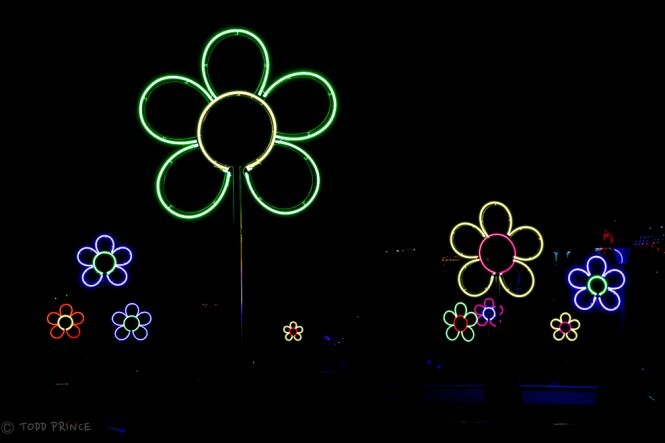 A flower-themed light installation at Park Tsaritsino.